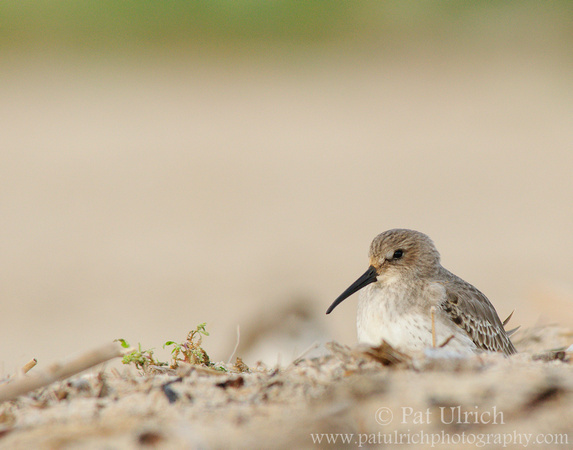 A dunlin peers out from a depression in the sand behind the dunes at Sandy Point State Reservation on Plum Island, Massachusetts. 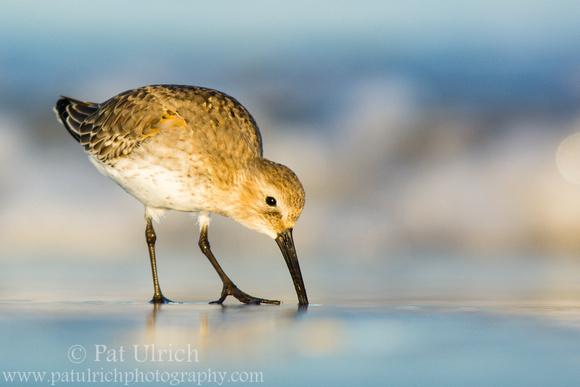 View more of my dunlin photographs. 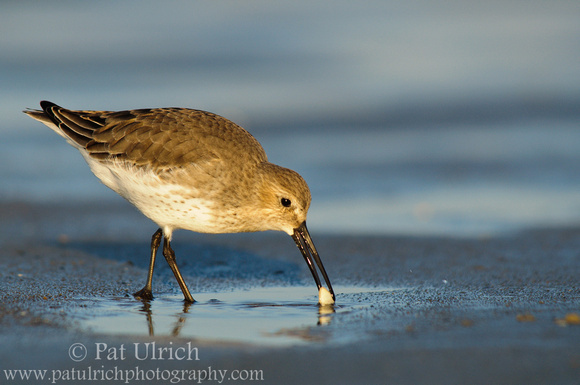 A dunlin pulls a small clam from the sand and washes it off before swallowing it whole for dinner. An extremely low tide at Parker River National Wildlife Refuge last fall exposed a large area of feeding grounds for the shorebirds, and there seemed to be a never ending supply of these clams to eat. 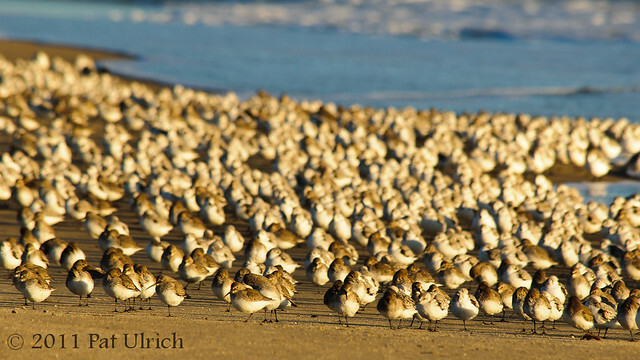 The density of prey species in the sand is amazing when you consider how frequently shorebirds pull them up, and how often the birds scour the area. 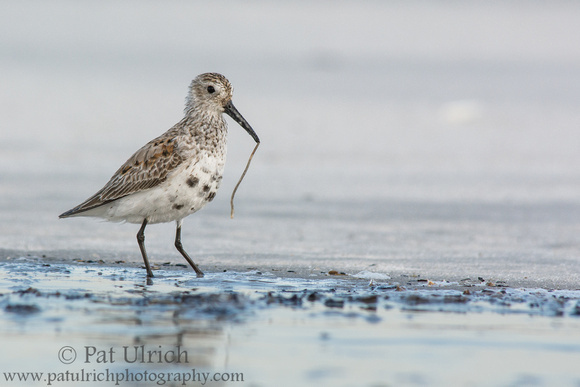 View more photos of dunlin. 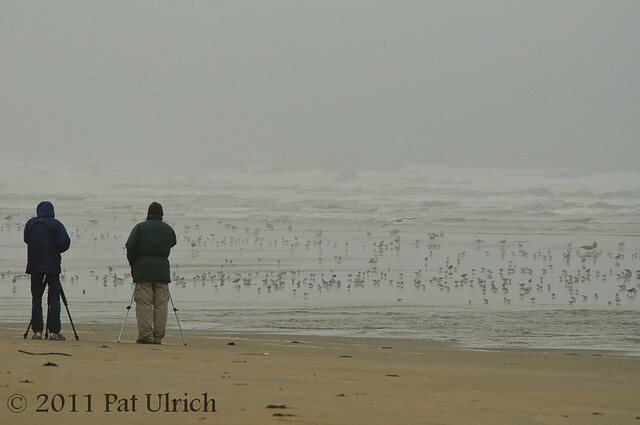 Throughout the fall there were a lot of migrating shorebirds feeding on the beaches of Plum Island, and I was surprised to see that some were still there when I went looking for a snowy owl last Thursday. It was not a huge flock, but maybe 50-75 sanderlings and dunlin were still chasing the waves as they rolled in and out on that cold afternoon. Unfortunately, the light was blah when I saw them, so I just watched them for a bit with the camera at my side. 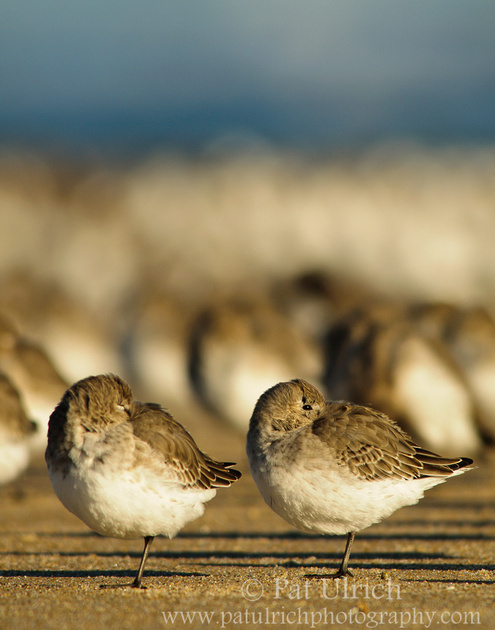 A pair of dunlin (Calidris alpina) rest at the front edge of a very large flock of mixed sandpipers. 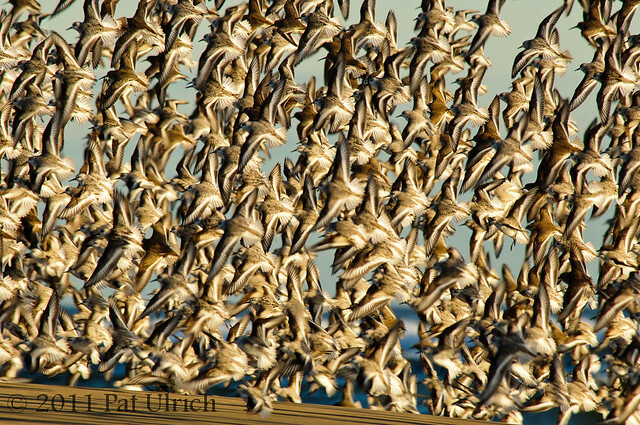 This image is from a morning that I spent with this flock as they tried to stay just above the waterline of the rising tide during my first sunrise trip to Parker River National Wildlife Refuge this fall. 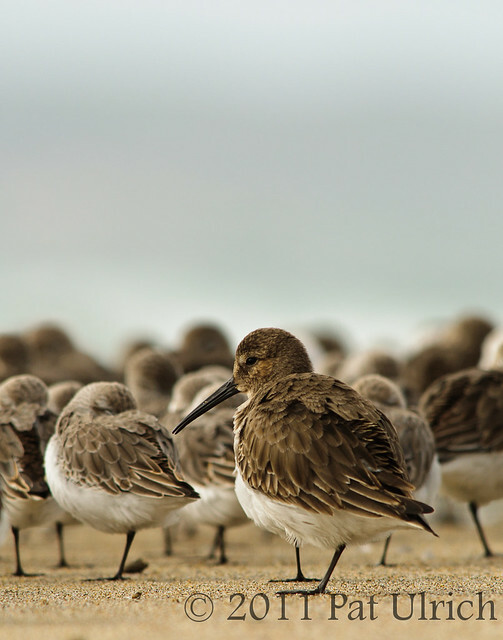 The squatty shape of sandpipers, especially when they are tucked in to rest, doesn't always lend itself to an interesting vertical composition. 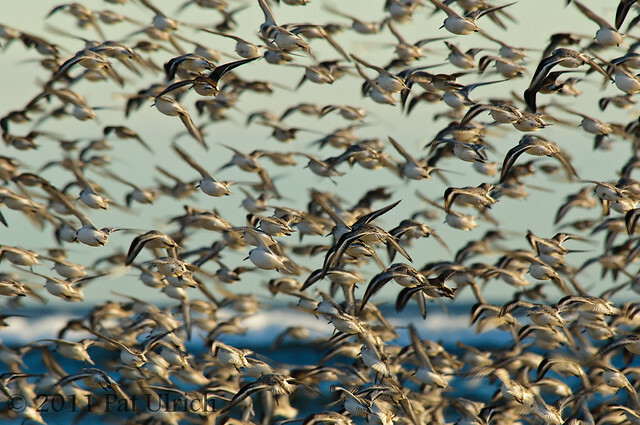 In this case though, I thought that the background of the large flock fading into the bright blue of the early morning ocean was compelling. It's so easy to view the world through only one orientation, especially since the camera is layed-out to be most comfortable that way, so I always try to remember to rotate the lens to vertical as I work over a scene. The seventh beach at Parker River National Wildlife Refuge on Plum Island came through for me again on Tuesday when I went out looking for shorebirds in the late afternoon. 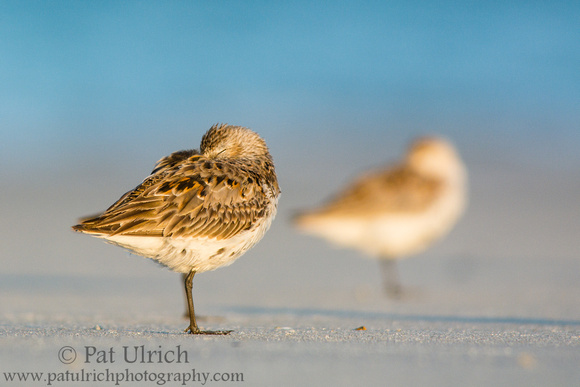 The weather was absolutely beautiful, which meant that there were many more people on the beach 2 hours before sunset than I had seen on my sunrise trips, but the birds didn't seem too perturbed by the small crowd. As the sun crept closer to the horizon, the beach started to empty out and it was mostly birders and other photographers wandering across the exposed sediments of low tide. It was a nice change of pace on this trip to have a flock of mostly dunlin and black-bellied plovers to photograph, instead of the sanderlings like on my previous trip. 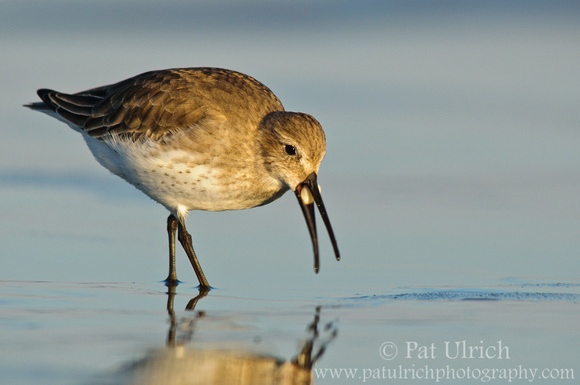 View more photographs of dunlin and other sandpipers in my Sandpipers Gallery. 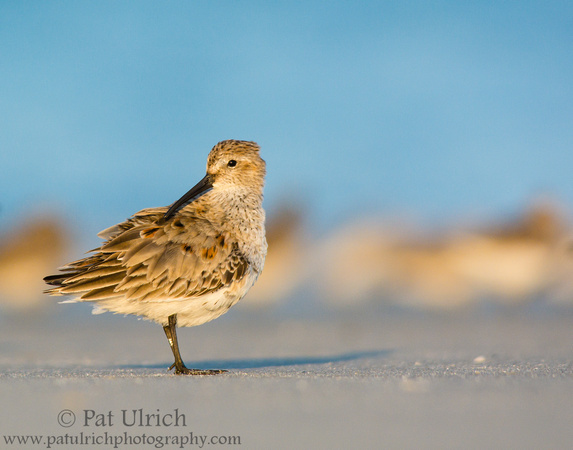 A dunlin stands alone with its shadow away from the rest of the flock at the Parker River National Wildlife Refuge on Plum Island. 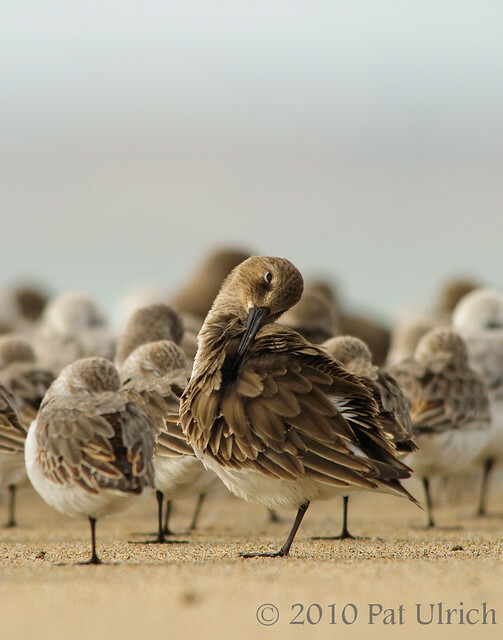 Finding pleasing compositions within a flock of birds can be challenging, and sometimes the most dramatic are when you can find an isolated subject set against an out of focus flock. I like how this bird gave itself some separation from the rest, and especially since it seems like its only company was its shadow. As I mentioned in my previous post, I had a wonderful first two days of wildlife photography in Massachusetts last week. 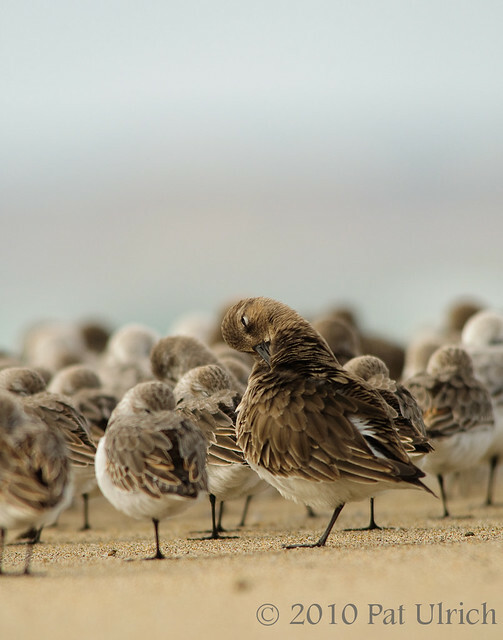 This lovely flock of sandpipers (mostly sanderlings and dunlin) were very friendly, and accepted me right into their flock. 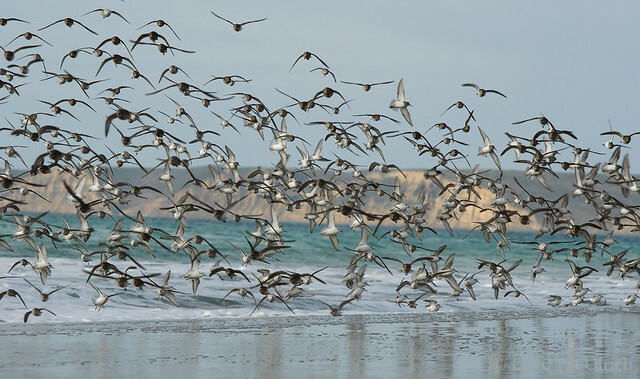 A handful of times while I was lying in the sand with them, something would spook the birds, and the whole flock would take off in a delightful show of calculated chaos! They would then circle around and land back on the beach. On more than one occasion the flock landed on three sides of me, leaving me quite literally in the middle (too much fun!). Better yet, since a bunch of them landed between me and the ocean, I didn't have to be as careful about keeping an eye out for waves that would get me wet, since every time the water started coming towards me, I would hear a loud uprising of irritated peeping coming from the sandpiper crew to my right. The four images in this post are all from one take-off and landing event as they circled around me, and are in the order that I took them. 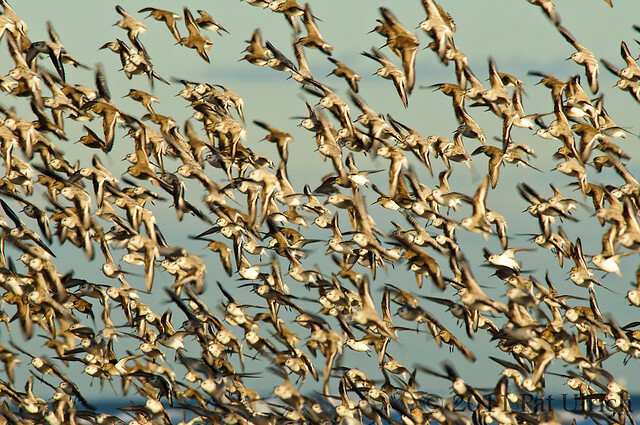 I always find it amazing to witness the movement of flocking birds, and it's so fascinating to see how closely they fly together without bumping one another. I also love to see the patterns that form as they rapidly change directions, and especially when the early light is still glistening off of their feathers. 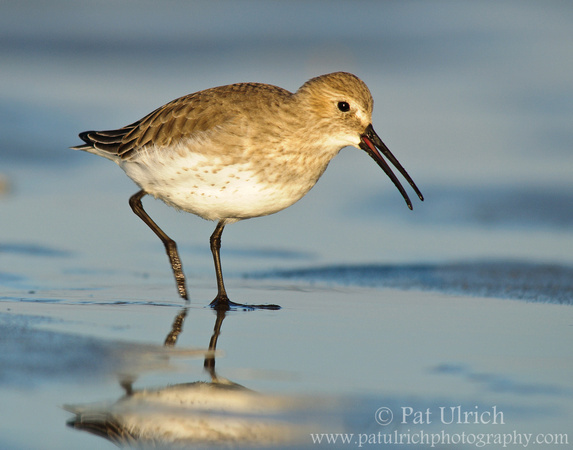 View more photos of these adorable shorebirds in my Sandpipers Gallery. This post was submitted to World Bird Wednesday -- follow the link to check out this week's posts! After a month of living in the great state of Massachusetts, I finally had a chance to get outside with my camera. Between the move, getting settled in a new city, my job search, and the death of my step-father, there had been little time to get out and experience my new home. Finally though, I had my first photography trips on Thursday and Friday mornings of last week -- to a fantastic coastal property in Northern MA, the Parker River National Wildlife Refuge. The forecast said clouds for Thursday, and since I have seen some amazing clouds out of my apartment window almost every day since moving to the Boston area, I had high hopes for beach photography under a pretty sky. Unfortunately, my first morning in the park was much more reminiscent of a day back in the Bay Area! There was ground level fog and drizzle all morning, which finally burned off to clear blue skies around noon. 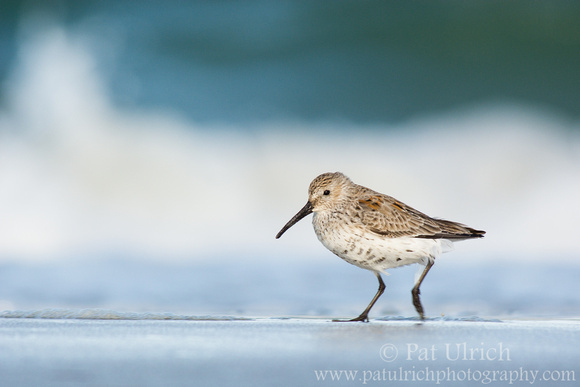 So while I still filled a memory card with heavily overcast shorebirds, it was not quite what I had envisioned while planning my inaugural trip to photograph the wildlife along the Atlantic coast. Thus, I decided to return for sunrise on Friday morning, since there was a forecast of clear skies -- and I was not disappointed. During my early morning drive along the highways to get there, I had wondered if I made the right decision to get up so early -- but once I made it to the Refuge and hopped out of my car into the cool, pre-dawn air, there was no doubt in my mind this was the right thing to do. I stopped at parking lot #1, and watched the sunrise break the horizon. There is just something so magical about this part of the day, and it's so energizing to feel the glow of those first rays of the sun. Although I must say, after 6 years of watching the sun set over the ocean, it was a bit odd to see it rise above the blue waters! I then drove down to the southern end of the refuge, and headed for the beach at parking lot #7, which is where I saw the large flock of peeps the day before. 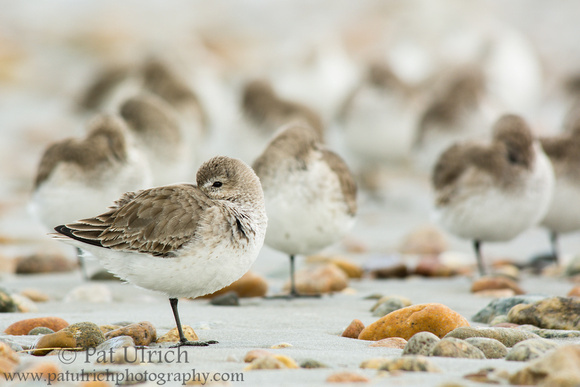 Much to my delight, the flock was still there, and it was comprised of some very friendly shorebirds -- the best Massachusetts welcoming party I could have imagined. 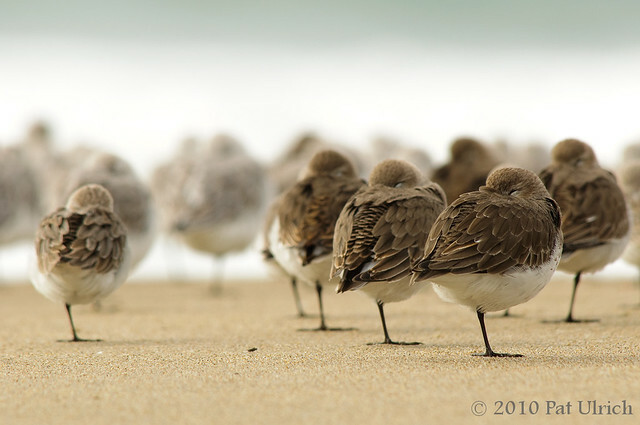 I then spent the next two hours or so laying in the sand with these birds. They went about their morning business of resting and preening, and after easily winning their trust I found myself as an honorary member of the flock. In fact, on more than one occassion, after they all took flight and circled around, they landed just a few feet away on all three sides of me. It was a perfect morning, and a great way to start my new adventures with wildlife photography in New England! In other news, the list of highly honored images for the prestigious 2011 Windland Smith Rice International Awards was released this week, and I am happy to announce that one of my photographs was selected for this honor. 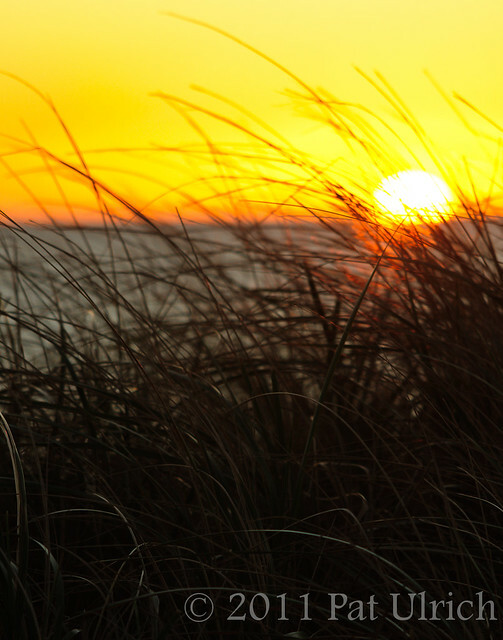 Look for it in print in the next issue of Nature's Best Photography magazine! 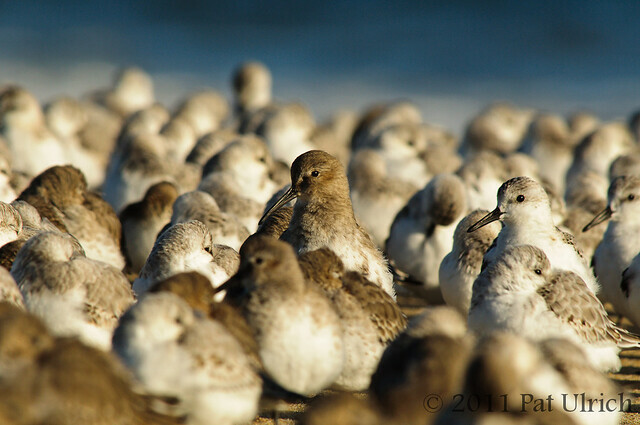 View more photos of peeps in my Sandpipers Gallery. 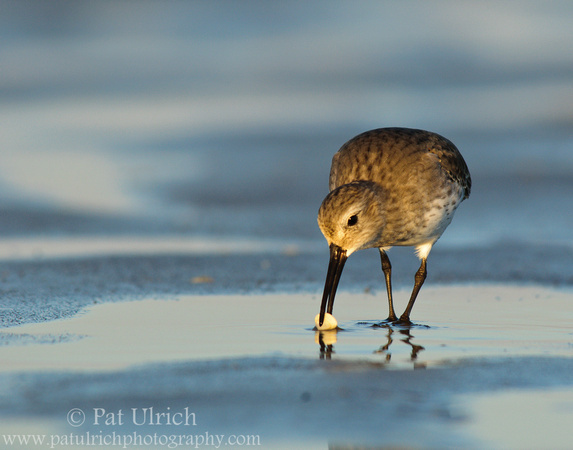 It's been a while since I posted some shorebirds to the blog, and I was getting that itch. Since most of them are up north on the tundra to breed right now, I've dug into the archive from last November to find a few to put up. 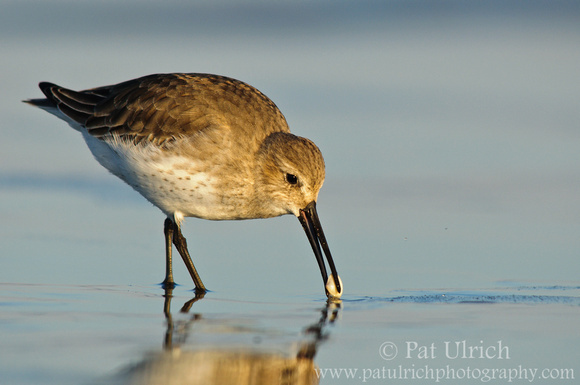 These are from a terrific morning that I spent with a very large flock of western sandpipers, sanderlings, and dunlin on Limantour Beach in Point Reyes National Seashore. 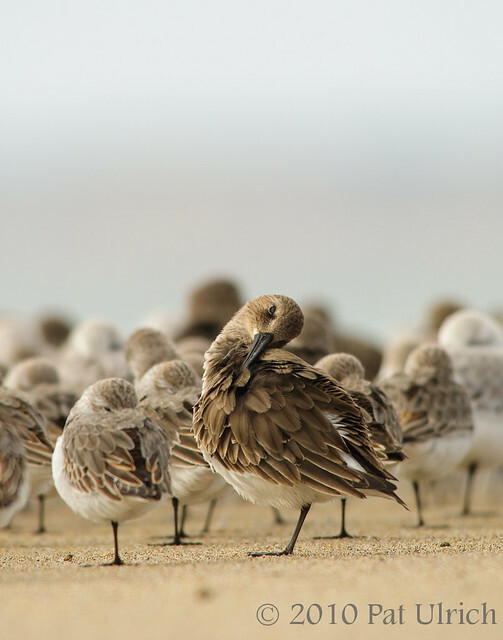 I liked how the dunlin stood taller than the other birds in this flock, and I took many different compositions with dulin having a head above the crowd. 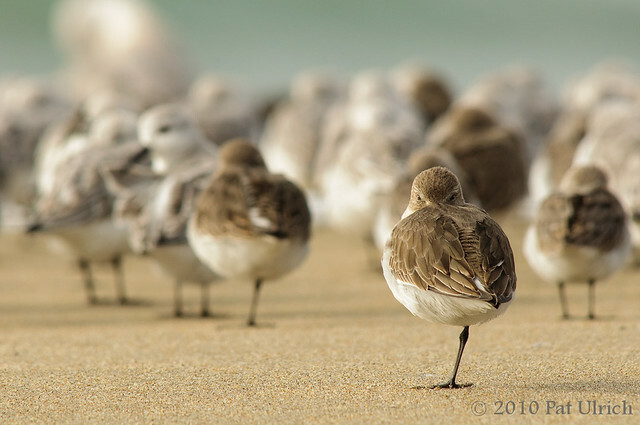 View more in my Sandpipers Gallery. 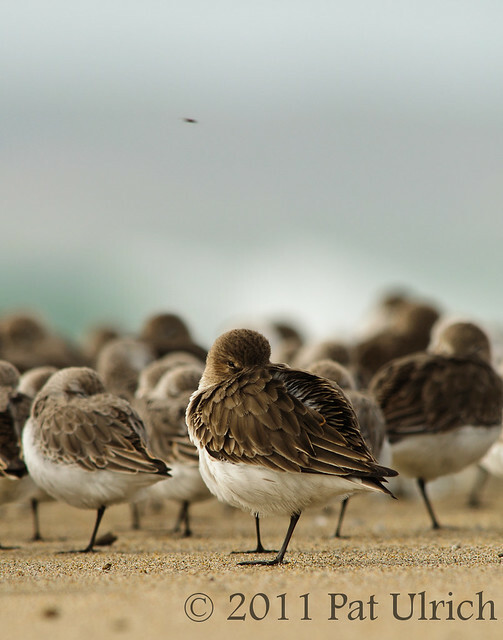 A small formation of dunlin and a solo western sandpiper relax on the beach at Limantour Spit in Point Reyes National Seashore. 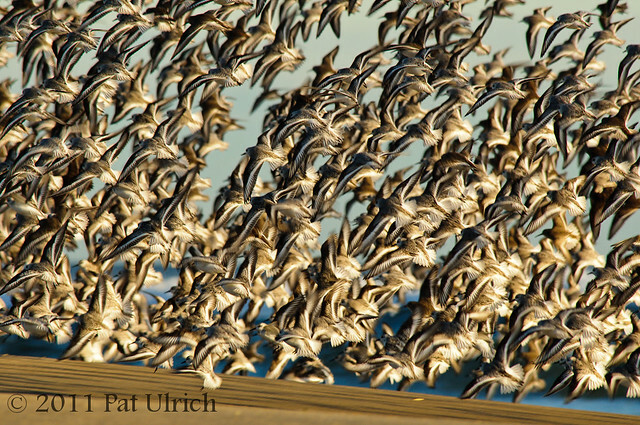 This is another frame from my encounter with this large flock of peeps that I saw there back in November. 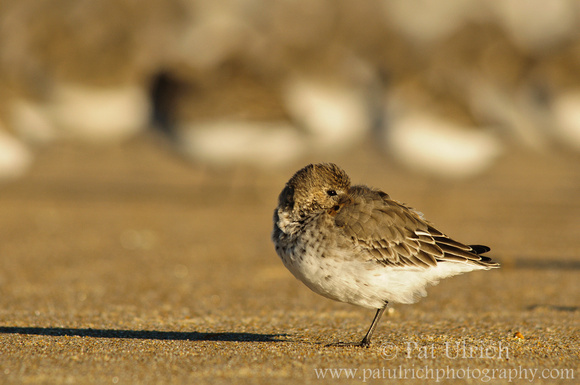 You can see a line of sanderlings out of focus in the backdrop as well. I also think its interesting in shots like these when you can so clearly see the width of the focal plane. If you look in the sand you can see the focus fade in and out, and its width must only be an inch or two (this is f/11 at 400mm).